The Missouri Botanical Garden has a special event going on right now, "Lantern Festival: Magic Reimagined". This is the second time that they have hosted a Chinese Lantern festival, the first being held in 2012. 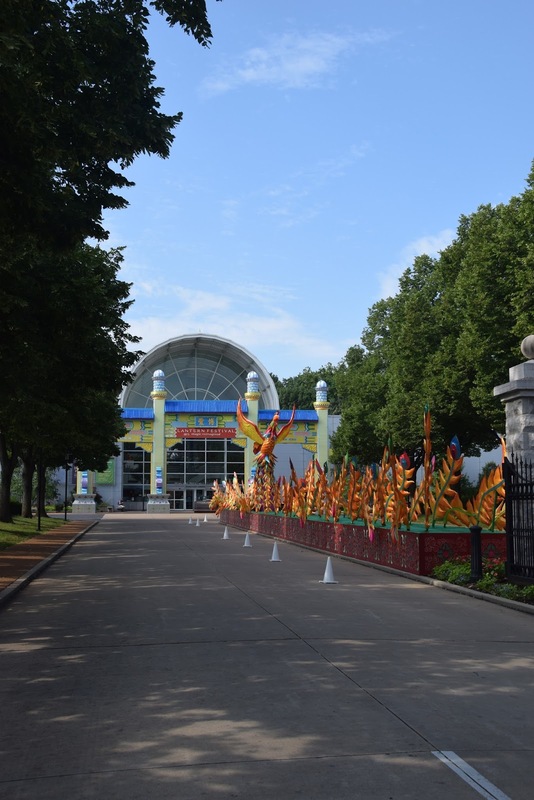 It is rare for lantern festivals to take place outside of China, so it is a testament to the close relationship the Garden has established with that country that we are blessed to have it in St. Louis again. The 22 lanterns are impressive during the day, but when they are illuminated at night they do indeed become magical. I wasn't sure that they could top the last festival, but this show is equally as impressive. On July 20th they offered a special night for photographers. Though it came with a fairly steep price tag, the attendance was limited and more importantly they allowed monopods and tripods to be carried in. Those are restricted on all other nights. I was unsure how "limited" it would actually be, but Jim and I were quite surprised. There was no problem with parking, and while I know the event was sold out the crowd was minimal. Add the fact that the rain held off and it was a comfortable temperature and humidity level, and all that equals a successful evening. They did not have any of the performances taking place that night, so that was too bad. 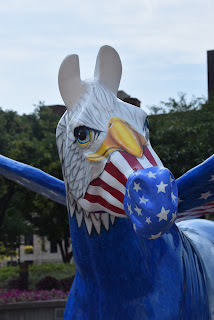 For the special events held at the Garden I like to go during the day to photograph all the sculptures.That way I get the lay of the land while it is light out, but also it is so interesting to see what they are made of. 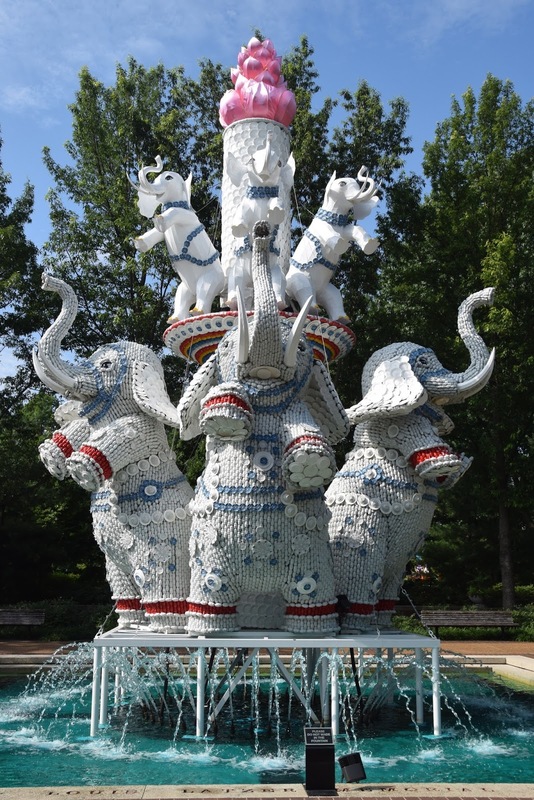 While most of the lanterns are constructed of traditional silk fabric on wire frames, two (including the elephants picture on the right) are comprised of porcelain plates, cups, bowls and spoons, tied together with intricate knots. The peacock is made of glass medicine bottles filled with colored water, while the dandelions are made of recycled bottles. While I did get some good photos that night, I am a little disappointed that the lanterns don't seem as sharp as I would like them to be. That is despite using my tripod and trying all different kinds of settings on the camera. I have seen pictures taking by other people that are way more sharp. They probably took them with their iPhones! Sometimes too many settings is not a good thing, especially for me. I should have taken some with my own phone just to compare. It is a little frustrating, and I suppose that tells me I need more practice. Regardless, the show is amazing and I highly recommend a visit. It runs until August 23rd. On Sunday morning my cousin and I made breakfast, cleaned up and packed our cars. 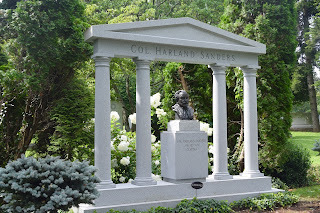 We had decided to visit Cave Hill Cemetery before we went our separate ways home. We both enjoy looking at and photographing old headstones, and this cemetery was established in 1848. 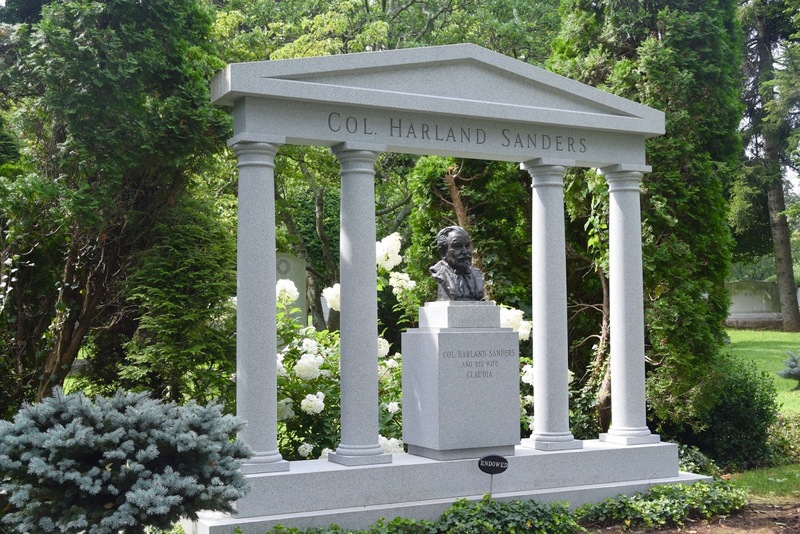 In addition to being the final resting place of Colonel Sanders (of KFC fame) and his wife, the cemetery has many interesting grave markers. 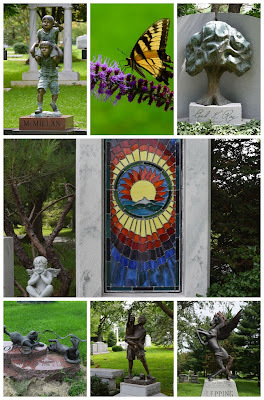 For example, I had never seen anyone use stained glass in a cemetery before - except for in a crypt. I was also amazed by the number of bronze statues decorating the graves. Certainly it is not unusual to see angels or busts of the dearly departed, but these were more decorative and, dare I say, fun. 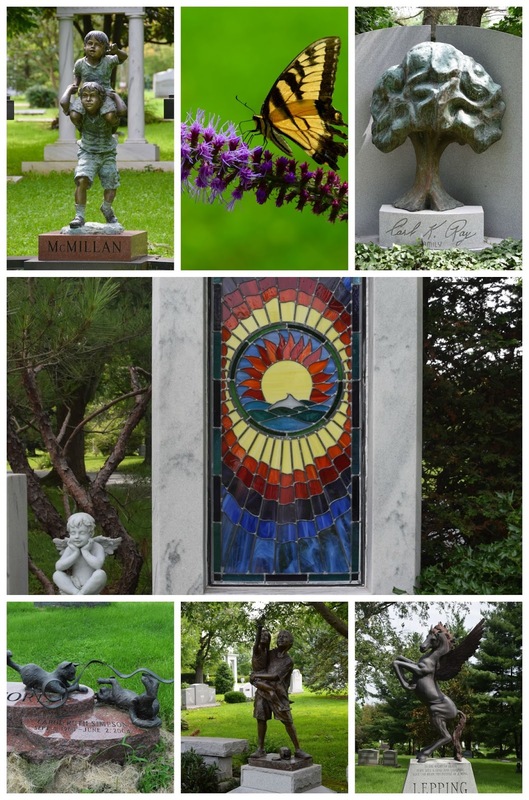 Set into the rolling Kentucky hills, the cemetery was beautiful and peaceful, and well worth a visit. My last stop before heading back to St. Louis was a Kroger Grocery Store. I was hoping that I was close enough to Cincinnati that I would be able to purchase some goetta (best breakfast sausage ever!) and/or some Skyline Chili. Sadly, the store did not have either of these items. I will have to wait until my trip to Cincinnati this fall. Overall, it was a nice little getaway weekend, despite the added adventures at the inn. But I did come away with some good stories, which is always a bonus! 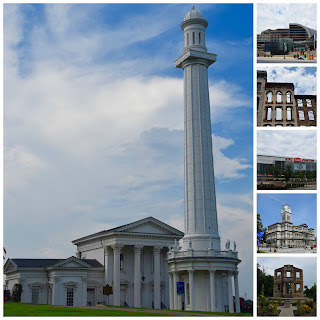 This past weekend I traveled to Louisville, Kentucky to meet up with my cousin from Cincinnati. 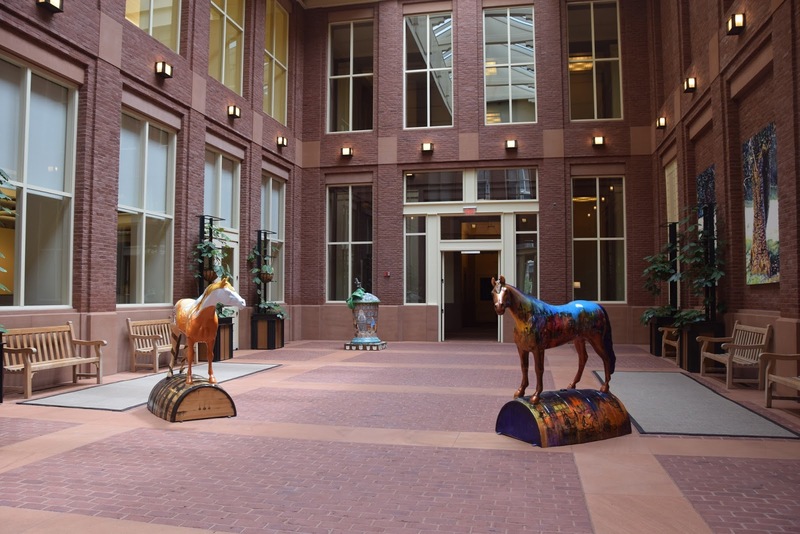 In addition to being a girls' getaway, we wanted to photograph Gallopalooza, an art display of painted horses, mint julep cups, and horses on top of barrels. Similar to the cakes that decorated St. Louis last year, these painted works of art will be sold at auction this fall to benefit lighting on the Big Four Bridge - a repurposed Ohio River bridge that is now for pedestrian and bike traffic only. I had made reservations at a bed & breakfast, of sorts. While they provide the makings of a breakfast, you have to cook it yourself. Maybe they should call it a bed & groceries? At any rate, I knew that ahead of time, so I can't complain. The cottage is located on an old estate, and is separate from the main house. Originally we were both going to be there for two nights, but my cousin decided to drive over early Saturday morning instead. That left me on my own for Friday. I arrived downtown around 2:30, parked, and headed to the Visitors Center to pick up some maps. Bonus - one horse inside, and a mint julep cup outside. Two off the list of 70 or so sculptures. I had decided to try and photograph the ones that were located inside buildings that were only open Monday-Friday. I enjoyed walking around downtown Louisville, appreciating the integration of old and new architecture. I managed to get eleven pieces before grabbing some dinner and heading to my b & b. The owner of the b & b indicated she might not be home when I arrived, but that the cottage would be open. That was the case, but she came to the door not too long after I arrived to introduce herself and see if I had any questions. Then she and her husband left to go see a movie. Around 8:00 I was on my iPad in the sun room when I saw a man with a flashlight come around the side of the main house. To say I was startled is an understatement. When I looked more closely, I saw that he was wearing a police uniform - as were the two other people that came from the front of the house. Yikes! I opened the door, and he informed me that the alarm was going off in the main house. He wanted to know if I lived there, and I explained I was a guest in the cottage. After inquiring as to whether the car in front of the cottage was mine (it was), the female officer wanted to know when I had arrived. I told her it was about 5:30, and she said the alarm went off about 7:30. I tried calling the cell phone of the owner, not expecting her to answer since she was at the show. Indeed, she did not, so I left her a message. In the meantime, the three cops (in three separate cars) got ready to leave me. They didn't see anyone around or any other cars, so they thought it was a false alarm. Did I mention that this place sits waaaaay back from the street? On 6.5 secluded acres? Nooooo, don't leave me! Haven't you people seen Psycho??? I locked the doors and closed all the blinds and sat in the sun room until the owner called me back shortly before 10:00. She said they would be home in ten minutes, and only when they arrived back at their house did I feel comfortable showering off the days sweat behind the shower curtain. As soon as I crawled into bed, the winds began, and I heard thumps on the roof followed by the sounds of things rolling. Heavy rains, thunder and lightning followed. I was positive something was going to fall on my car. Around 12:30 I was awakened by a new sound in the bedroom. What now? I turned on the lights but could not identify what was making the motorized noise. I turned off the air conditioner, but that wasn't it. Ear plugs and a pillow over my head did not squelch the sound. I didn't get much sleep that night! I later learned that the electrical storm shorted the pump for the septic system, causing it to run non-stop. It is located under the cottage. After my cousin arrived in the morning, we took off for our horse-hunt. We were fairly successful in finding the ones I had marked on the map, but I sure missed the Facebook community I had on my Cakeway to the West journey in St. Louis. At any point in time a person could post a question and immediately get an answer. That was really helpful when the cake wasn't where the map said it should be. There were several horses that weren't where the map indicated, and a couple that were not on the map at all. But the city was easy to navigate, and we enjoyed seeing the sites. The evening ended with a visit to an excellent restaurant, Pat's Steak House, which was a throw back to a 1950's supper club. The food and service were great, and we returned back to our cottage where, fortunately, there were no things that went bump in the night. We were able to rest up for Sunday's adventures. 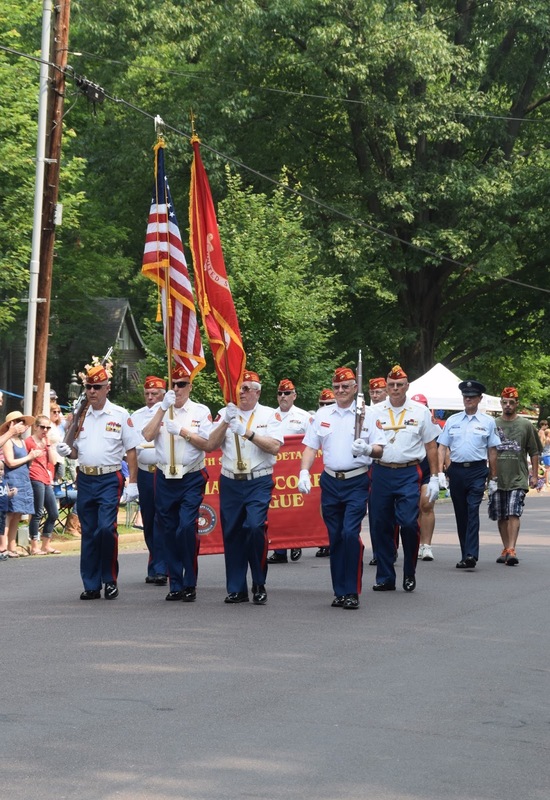 We did the usual and customary (for us) things over the July 4th weekend. Jim's office celebrated the holiday on Friday, so we were actually able to go play pickleball together during the day for the first time. Only four people showed up to the special session in Affton, so we got a lot of playing time in. 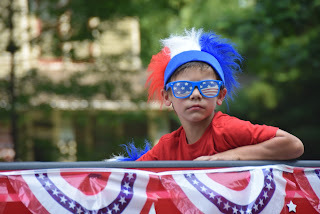 Saturday was our local community parade, and we are lucky in that it passes just a couple blocks over from where we live. 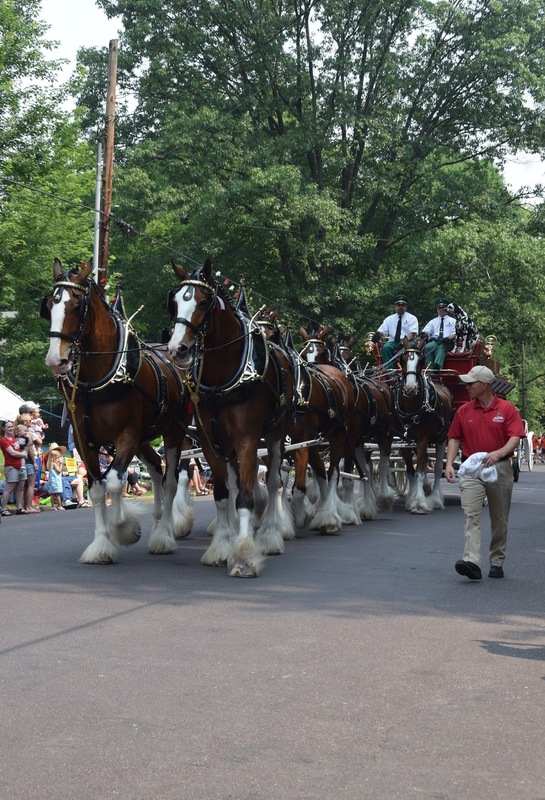 We can just grab our chairs, a small cooler, the pooch, and walk over. We had been sitting on the same parkway each year for over 20 years, but those homeowners had the audacity to sell their house. How rude! The new owners have a party and they take lawn chairs and rope off their entire parkway. Doubly rude! 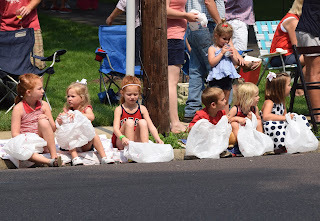 That spot was great due to several large trees, and we could sit in shade the entire duration of the parade. We wandered a little further up the street and found a small spot next to a driveway just big enough for our two chairs. With the slope of the drive, I told my husband that no one would be able to set up chairs there. "The only way our view will be blocked is if someone decides to stand there." Famous last words. A man from the huge party going on across the street came over to our side with his wife and granddaughter. And they stood, which would not have been bad except the guy was taking non-stop photos and/or videos of the little girl, stepping into the street to do so. My husband politely asked him to step back as we couldn't see, and he did so after shooting us a dirty look. That lasted about 5 minutes before he was back in the street again. Unbelievable. 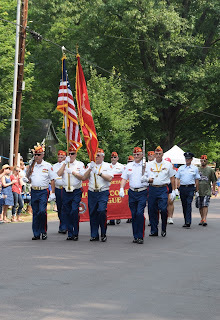 Nevertheless, it was a very nice parade and we were blessed with perfect weather this year. Saturday night we walked up to the end of our street to watch the fireworks. The display was good, but the people watching (and listening) was even better! On Sunday we went to visit my niece at Barnes as she had open heart surgery to repair a valve on July 1st. I went the day of surgery as well as the day after, but this was the first time Jim was able to go with me. We didn't stay long as she was understandably not feeling up to much company. From there we went to look at one of Jim's projects, Cortex. It is really something! I am so impressed with the quality of their design work. As an added bonus, I was finally able to find out where it's at!